You know you’d be eating balanced and well at Six Senses, a brand that pays high attention to wellness and sustainability. At Yellow Pot, Six Senses Singapore’s modern Chinese restaurant, Chef Sebastian Goh delivers a contemporary Chinese menu that avoids unhealthy additives, banging his buck on sustainably-sourced ingredients and local produce and contemporary techniques to please the diner’s palate. And it works. Practically everything is made from scratch here- all sauces are made in-house, and there is no use of sugar or salt as well. 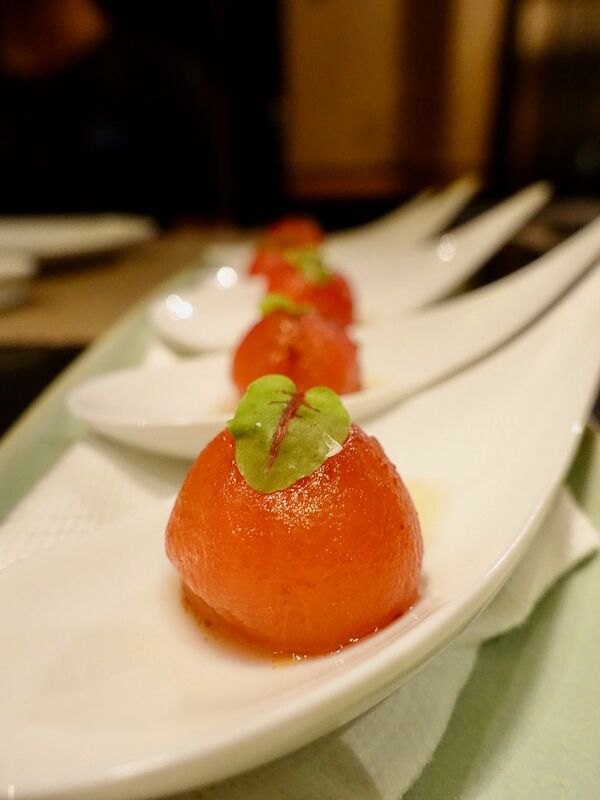 We started with a juicy and refreshing Chilled Organic Vine-Ripened Tomatoes ($8 for 4 pcs) which were infused with preserved Li Hing plum and Farm Delight micro herbs. I was amazed by the tomato- it had a crunchy exterior but a plumy and jammy inside. Great way to whet your appetite. 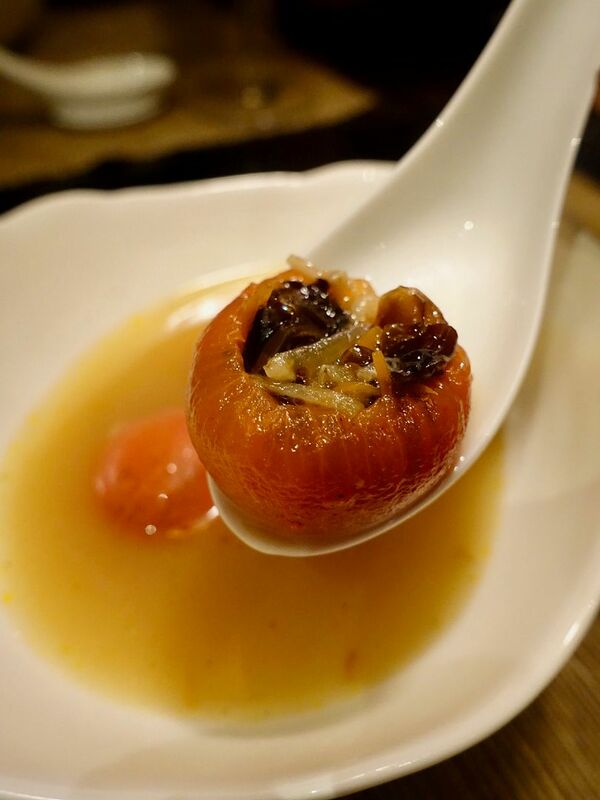 Next, a rejuvenating Chicken Soup ($12/portion) slow-cooked with a shimeji-stuffed tomato. The rich but not cloying soup is made from simmering chicken for a good 3 days to extract all that goodness. The organic vine-ripened tomatoes are stuffed with an assortment of mushrooms, including wood ear mushrooms, enoki and shimeji and it has a comforting ginger zing to it. We then moved on to the seafood and meat dishes, which are intended for sharing, and portioned accordingly. 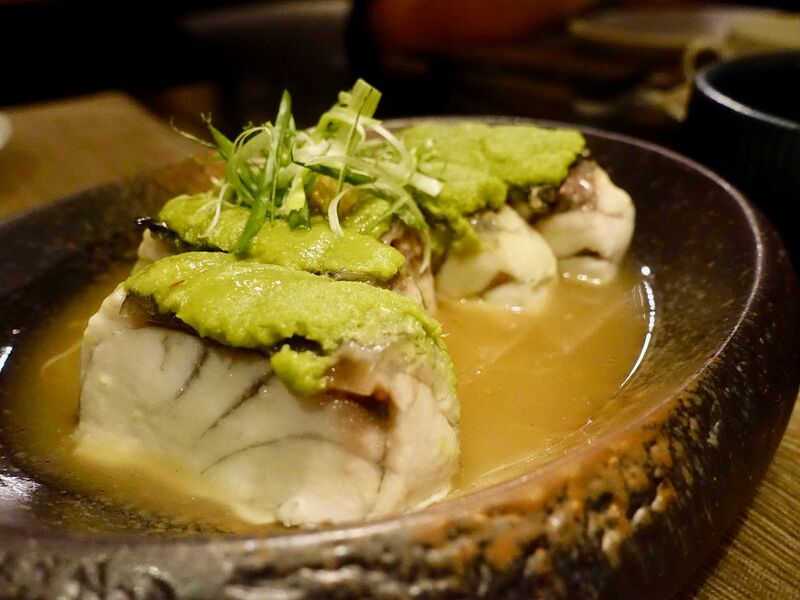 Going with the lighter flavored meats first, we had the sustainably farmed Steamed Kühlbarra Barramundi ($22). 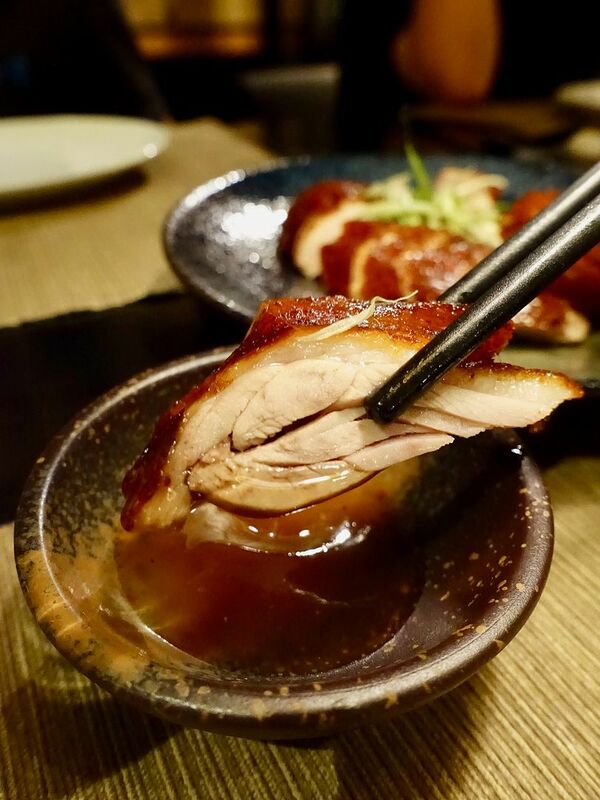 Instead of soy sauce, the fish is served with a savoury house-made fish stock of anchovies, fish bones and trimmings. No food is gone to waste at Six Senses! The ginger-scallion pesto that tops the fish reminded me of the ginger sauce that accompanies samsui chicken. Yums. The Seared Pork Cheek ($12) at Yellow Pot tasted like a cross between satay and 羊肉串. The meat is first marinated with lemongrass, garlic, shallots and celery to help tenderise it naturally. 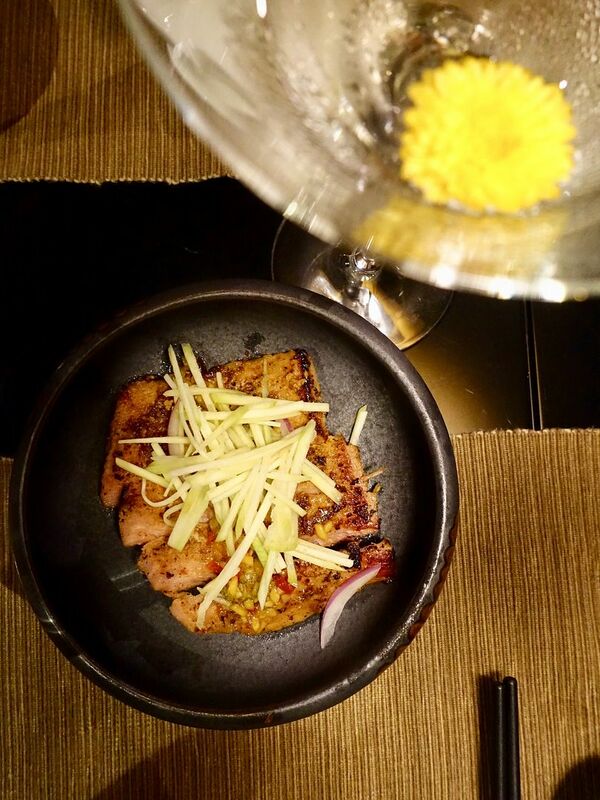 It is then seared with cumin chilli powder for a flavourful spice, and served with julienned green mango to cut through the fattiness of the dish. The Wok-Seared Organic Grass-Fed Beef Tenderloin ($36) had to be accompanied with a bowl of fragrant rice because sauce- a honeyed crushed Tellicherry peppercorn sauce with crispy garlic. The Do not fear that your tongue is playing tricks on you if you feel a light tingling sensation eating the juicy medium rare meat, there is just a hint of Sichuan peppercorn in this dish as well. 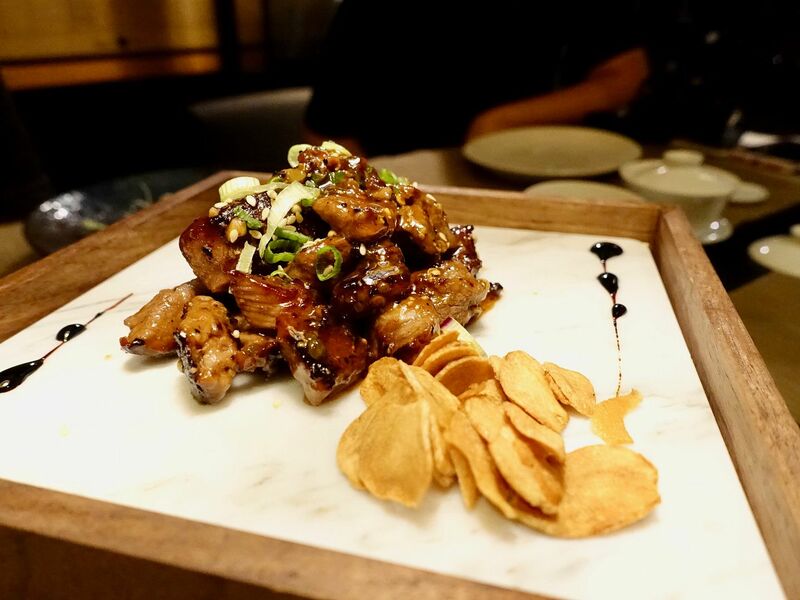 A dish that cannot be missed is the Roast Duck with Fermented Bean Curd Marinade ($32 for half). Oh that crispy glistening skin and juicy meat with a woody fragrance smokiness! 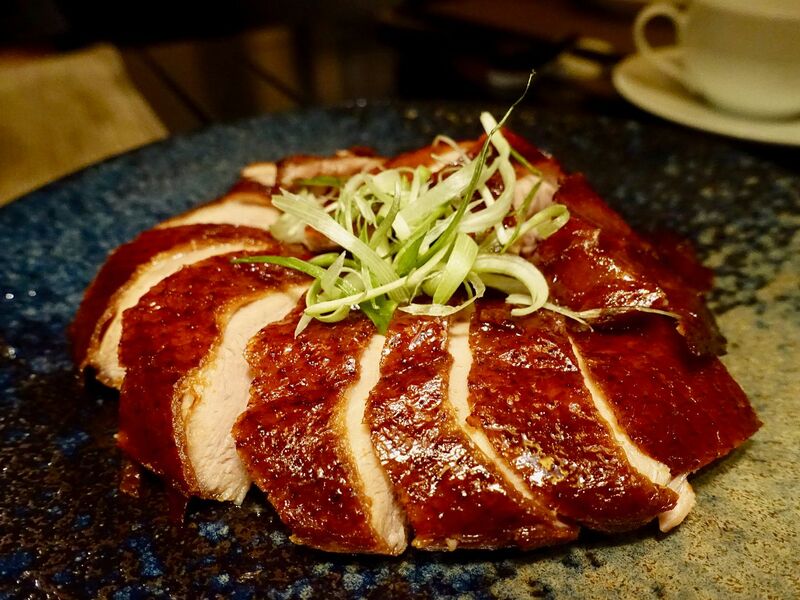 The duck is marinated for two days with a fermented bean curd marinade consisting of herbs, star anise, bay leaf, fermented tofu, cinnamon and locally produced five-spice powder, before being roasted in the traditional Apollo oven using hickory wood chips. Every bite was an explosion in my mouth. For vegetables, i preferred the flavorful Braised Sweet and Sour Eggplant ($14) over the Braised White Cabbage ($12) with conpoy, wolf berries soaked with Shaoxing wine. 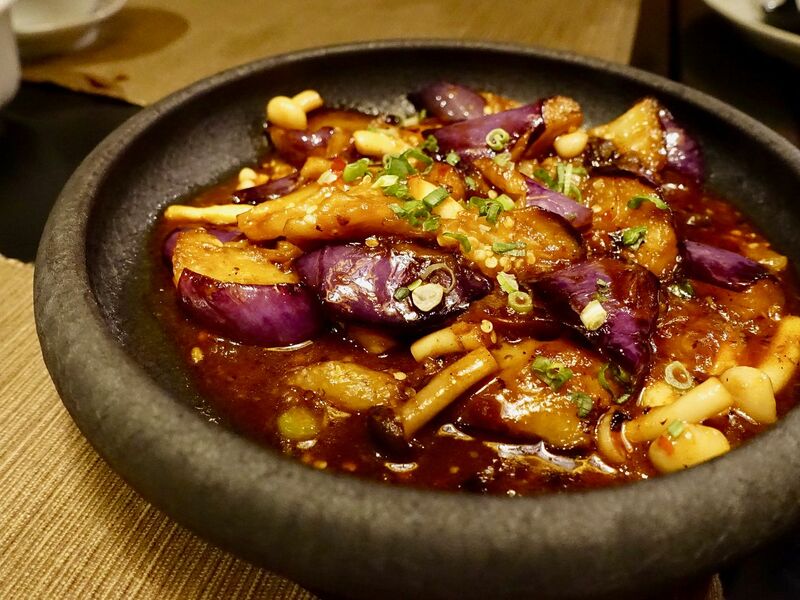 The eggplant is flash-fried, then braised with a sweet and sour sauce made from honey, vinegar, Nanyang soy sauce, and house-made hot bean paste. It is served with assorted mushrooms. This is another dish that has to be accompanied with rice and i loved how the eggplant wasn't mushy at all. This is the perfect meatless dish imo. 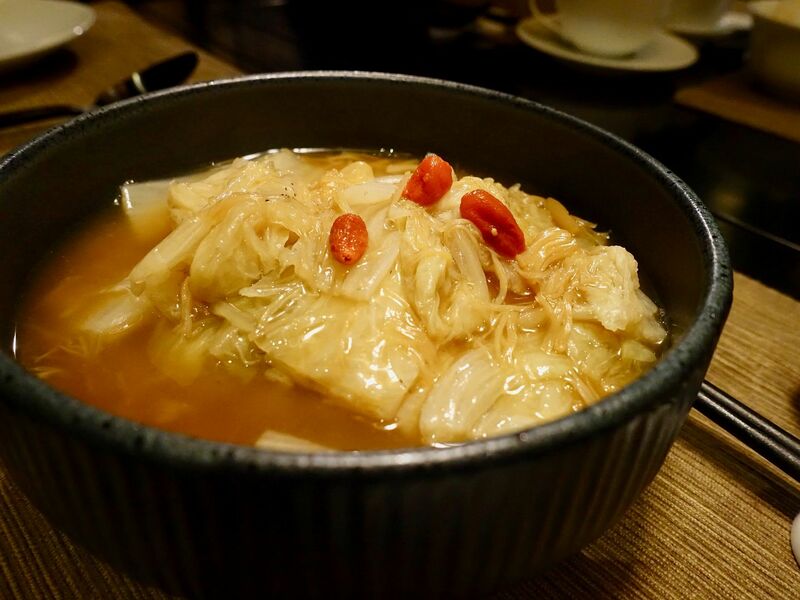 On the other hand, if you are into light flavors, the braised white cabbage in house-made chicken broth, conpoy and Shaoxing wine would be your go to. 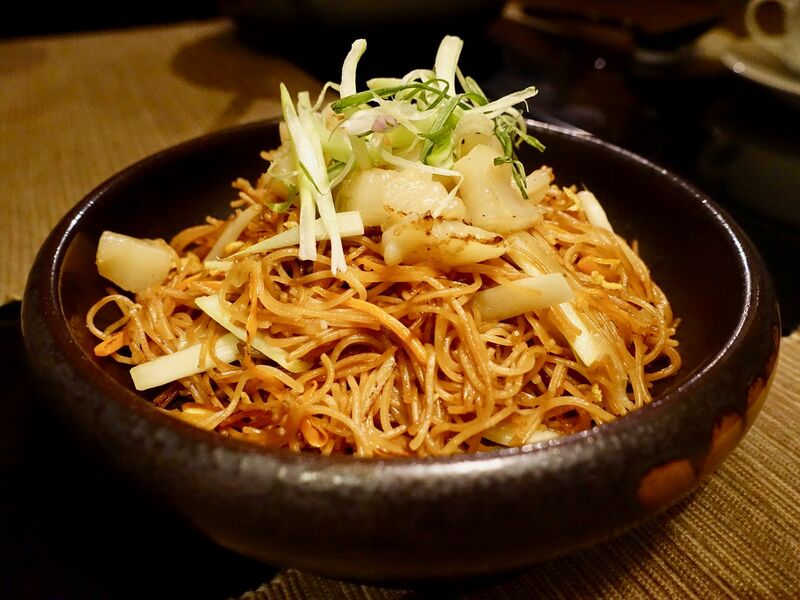 Like any Chinese meal, it typically ends with a carbohydrate and our expectations were raised as our host couldn't stop raving about the Stir-fried Mee Sua ($18) for the entire duration of our dinner. Well, i must say this simple dish was very addictive. I enjoyed the crunchy texture which was almost like a beehoon, and also the light sweetness that comes from the specially sourced Nanyang soy sauce. Other pops of sweetness came from the tiger prawns and Hokkaido scallops. 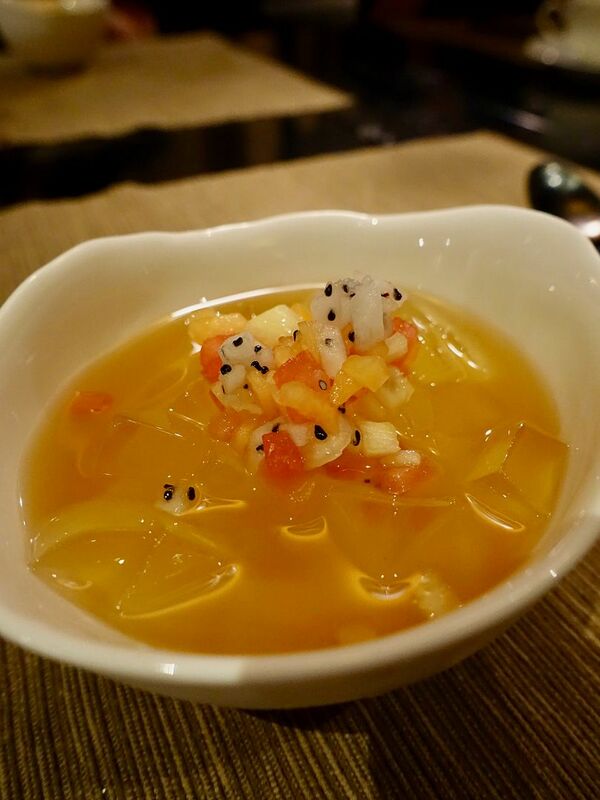 Sweet endings come in the form of house-made Lemongrass & Calamansi Jelly ($8 with fresh fruits). We also had the Hand-blended Almond Tea ($7) made from high grade almonds. Yellow Pot offers artisanal Chinese teas specially curated by Yixing Xuan Teahouse, a family-run teahouse just around the corner from the hotel. There is a tea guide to help you with tea appreciation. If you live life in the fast lane, Yellow Pot has the right poison for you too. A selection of signature Yellow Pot cocktails ($22 each) incorporates native Chinese herbal ingredients, and sweet botanical accents. 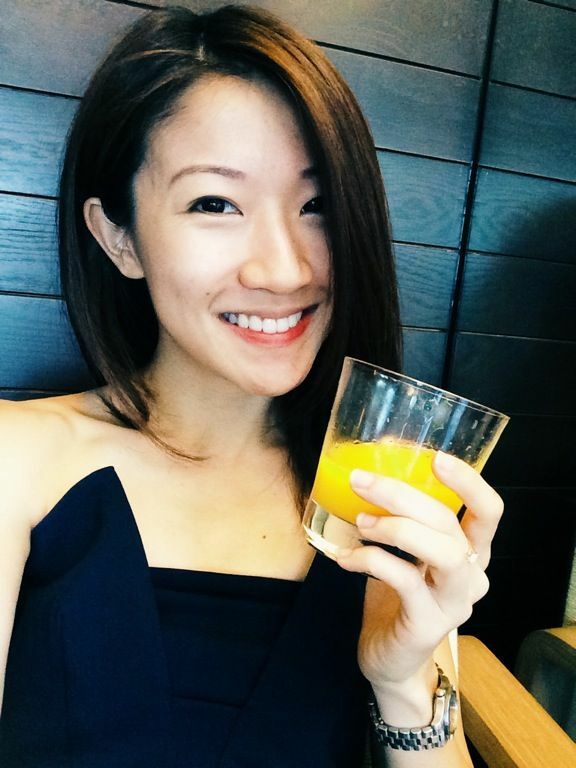 I had the bar’s trademark cocktail Escape to Kaifeng, a strong Tanqueray London dry gin drink infused with house-made chrysanthemum cordial for some floral accent. It's strong stuff nonetheless. I sure could see myself nursing a couple of cocktails with their interesting bar bites such as Lemongrass Pork Sliders ($12) topped with bonito and wakame slaw; Curry Marinated Prawn Ball “Xia Qiú” ($14); or some addictive Sichuan-style Popcorn Chicken ($14). Overall, great experience at Yellow Pot. 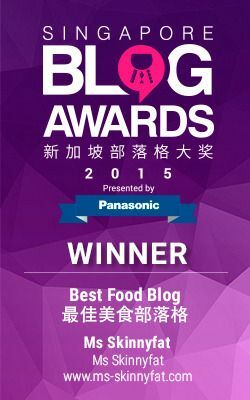 Definitely a place to go to for comforting and healthy Chinese dishes and cocktails (because i believe in balanced eating like that).